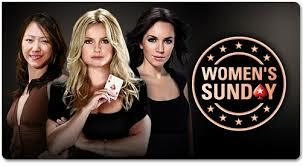 PokerStars had a fairly original idea earlier this year, to establish a Women’s Sunday Special tournament that would run in parallel with its more prominent peers. Weekends are famous for hosting some of the best tournaments online and those who have an account with the aforesaid poker company have plenty of events to choose from. The buy-in can be prohibitive for many, because there are not too many players who can afford to pay a three digit amount for an event in which they compete against thousands of peers. That’s what qualifiers are for and they run live throughout the week, which means that players have plenty of time to climb the ladder one step at a time. The idea to host a Women’s Sunday Special came after Vanessa Selbst won another World Series of Poker bracelet and became the new leader in the player of the year leaderboard at GPI. She posted impressive numbers over the last couple of months and made a solid contribution to the success of female poker players. Nowadays, there are fewer would doubt their ability to compete at the same tables as men, but it definitely doesn’t hurt having a special tournament celebrating them. PokerStars jumped on the bandwagon right away and set up a tournament that would have a guaranteed prize pool of $30,000, one that is expected to be surpassed on each occasion. The reason for why the organizers are so optimistic is that several poker professionals are expected to participate, drawing a lot of attention. Vicki Coren and Liv Boeree will surely join Vanessa sit at the tables and as always, those who manage to kick out a PokerStars Team Pro will receive a bounty on top of the standard payout. The very prospect of participating in a brand-new tournament is alluring and the premiere will attract numerous participants. The buy-in will be a puny $55 and despite the fact that the tournament goes by the name of Women’s Sunday Special there will be no restrictions for participants in terms of gender. Besides the regular payouts and the bounties that have been increased to $100 for eliminating any poker professional, participants can also hope to win special items. Among them, an autographed book by Vicki Coren “For Richer, For Poorer: A Love Affair with Poker”, a T-shirt signed by Fatima Moreira de Melo or a customized poker chip autographed by the British sensation Liv Boeree. The date of the tournament is yet to be revealed, but it is only a matter of time until players will get to sit down at these tables.